Not every trade is going to go your way. We’ve all experienced it many times before. Setting stops is of the utmost importance to protect yourself from a serious loss. It’s like buying insurance. Anything can happen during a trade. You could be long and there’s a sudden sharp drop, and by the time you get out, well your account could be in seriously bad shape, or even wiped out. Does this scenario happen often? No, but it does happen, and you don’t want to be left holding the bag. It is true that when you set a stop, other traders can see it. And yes, some traders may try to trigger your stop. But the risk of a severe loss overwhelmingly outweighs the loss from the possibility that other traders may target your stops. So, make sure to set a stop, or suffer the consequences. Stops should neither be too loose, nor too tight. 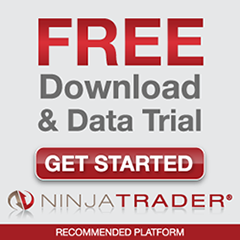 A stop that’s too loose will increase the loss you incur if a trade goes against you. Yes, you want to give the trade a chance to breathe. But, if you feel the need to have a loose stop, then you should rethink your entry strategy. If your stop is too tight, you’re likely to get stopped out before your trade has a chance to move in your direction. As you can see, there’s a delicate balance to setting the right stop. 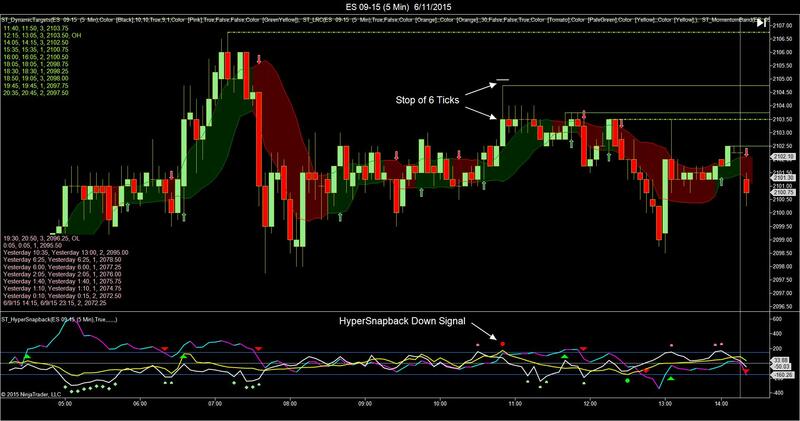 If you’re using a solid, high-percentage indicator like the HyperSnapback indicator, then on a 5 minute ES chart, for example, you should set your stop 6-8 ticks behind the signal. This would give your trade ample room to go your way while not causing much pain if it happens to go against you. Click the chart to enlarge it. Also, keep in mind that stops are relative, meaning that different time frames will require different stops. On a 3200 tick ES chart, you should set your stops 10-12 ticks behind the signal. So, it’s important to take into account what time frame you’re entering on. And also keep in mind that some instruments, like GC, are more volatile and thus require looser stops. Yes, trading GC is more risky. Be aware of this when setting your stops. Here in California, drivers are famous for rolling through stop signs. If you do that when you drive, definitely don’t do it when you trade. If you set a stop, don’t extend it as the trade progresses against you. It’s tempting to think “Oh, the trade is just about to turn my way, it just needs a little more room.” DON’T DO IT! That’s a slippery slope you don’t want to slide down, because it leads nowhere good. Is it possible your trade could turn around if you just opened up your stop a little? Yes, but odds are you’re going to lose a lot more money in the long run by extending your stops. Stick to your stops or your stops will stick you. Of course, it’s ok, even advisable, to move your stops closer when your trade goes into profit. That’s a trailing stop, and a whole different strategy for another discussion.